Search the best East Atlanta homes for sale & Atlanta GA neighborhood below! The East Atlanta of 10 years ago is a far cry from the East Atlanta of today. Revitalization has taken hold of this enclave located (obviously) east of the city center, but don’t start throwing the word ‘gentrification’ around just yet—this nook of Atlanta has got a soul it’s not eager to shed anytime soon. Looking for additional information regarding East Atlanta properties for sale in Atlanta? Schedule a private showing by contacting your East Atlanta real estate experts today. Searching for the right home to purchase in East Atlanta? Call (404) 270-9374 to reach your local real estate agents, The Keen Team. Our team is here to guide you through the East Atlanta, Atlanta real estate market. Atlanta’s hipster mecca blends counterculture and community, all backed up to a soundtrack by some of the best underground music venues in the city. 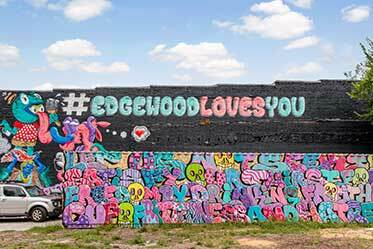 At the core of this neighborhood, is East Atlanta Village (EAV, as the locals call it), to which outsiders flock for some of the best little dive bars in the city, complete with a perennial lineup of local acts and visiting bands. Along with some funky, Bohemian boutiques, the restaurant scene, too, has ramped into high gear, with some blink-and-you’ll-miss-them eateries that cater to the late-night crowd. For all of its eccentricities (and often because of them), and rough charm, young professionals have begun to set up shop in East Atlanta, lured by the promise of a quirky historic home with some yard space to grow into. With proximity to the city (hardly more than three miles to Downtown by car), it’s easy to understand why this corner of town has earned its comparison as Greenwich Village—with a Southern twist. East Atlanta is located (appropriately enough) east of Atlanta, by about three miles. The northern edge of this neighborhood is bordered by I-20, at the intersection to Moreland Avenue (with plenty of access points to the interstate). As far as surface roads are concerned, Memorial Drive is just a few blocks to the north, also offering a straight shot to Downtown, Midtown, and the Connector, as well as to the Perimeter. 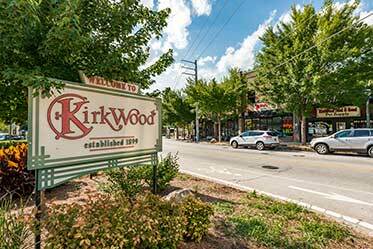 There’s a ‘centrally located’ element to East Atlanta, too, as this part of town is located close to some trendy hangout spots, like Kirkwood, Edgewood, and Little Five Points. East Atlanta isn’t a very large neighborhood, and as far as public green space is concerned, it’s defined by one main park. Brownwood Park is located just south of the Flat Shoals/Glenwood intersection and contains a fine little recreation center, some game courts, a kids’ area, and plenty of natural shade, all lovingly restored and maintained by concerned citizens. You hear nightmare stories about parking in Atlanta, but in East Atlanta, it’s actually not too hard to find a spot (even if you’re opting for some coveted street parking). As is always the case in Atlanta, however, keep an eye on the fickle street signs so you don’t get towed. If you’re visiting, do so on the weekend, and find the intersection of Glenwood Avenue and Flat Shoals Avenue (you’ll see a mini flatiron building at the corner). This is the epicenter of town, and it contains the majority of the shops, venues, and eateries. Ask around to see what’s going on. The locals have their fingers on the pulse of their neighborhood, and will be happy to point you to a show, or to a great place to grab a cold beer. For many of the singles and young couples who move to East Atlanta, the quality of the school system isn’t a priority. The public schools in this area aren’t rated very well, though a few private institutions are close by. Here’s a complete list. East Atlanta is a little off the beaten path (that’s kind of the point), but it’s actually pretty easy to get into and out of. I-20 is easily accessible from Moreland Drive, the latter of which connects to some of the more well-traveled thoroughfares slightly to the north. The I-75/I-85 Connector is located about three miles to the west, while I-20 bucks up against the northern edge of the neighborhood. East Atlanta isn’t the most MARTA-accessible part of Atlanta. The nearest stop, the Edgewood-Candler Park station, requires crossing an interstate overpass and a mile’s walk north, to DeKalb Avenue. Quirky and utterly hipster, this farmers market gathers every Thursday night (4 p.m. till dark) from April to December. If home-roasted coffee and artisanal kimchi are your flavors, you’ve come to the right place. 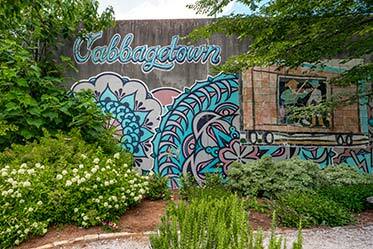 Held of the third Saturday in September, this decidedly EAV-themed festival features a parade, a 5K fun-run, lots of food, and of course, more live music than you can shake a stick at. If you're considering a home in East Atlanta, connect with our Atlanta real estate professionals for help with the ins and outs of local properties. Our East Atlanta real estate agents have up-to-date knowledge on the unique market dynamics of East Atlanta real estate. Contact The Keen Team for more information on representation for East Atlanta buyers and sellers. If you're planning the sale of a house in Atlanta, visit our free property evaluation page to find the value of your East Atlanta residence now!